Read Stephanie Lämmert’s review of the Zambian writer Mukuka Chipanta’s recently published debut novel A Casualty of Power, a story about the Chinese-Zambian relations in the Zambian copper industry. Since the privatization of the Zambian copper mines in the late 1990s, Chinese contractors have become heavily involved in the copper industry as well as in other sectors of the Zambian economy, including construction and agriculture. Large-scale investments in tax-free zones have brought economic prosperity for Zambia, but there is at least an equal amount of criticism. Chinese investors have been criticized on account of unsafe working conditions, violations of the Zambian labour law including salaries too low to survive on, and the use of abusive language and beatings. Tensions between Chinese supervisors and owners and Zambian mine-workers have resulted in a number of violent clashes, the most prominent being the shooting at the then Chinese-owned Collum Coal Mine in 2010 that left thirteen Zambian miners injured and the subsequent protests two years later during which one Chinese mine manager died. 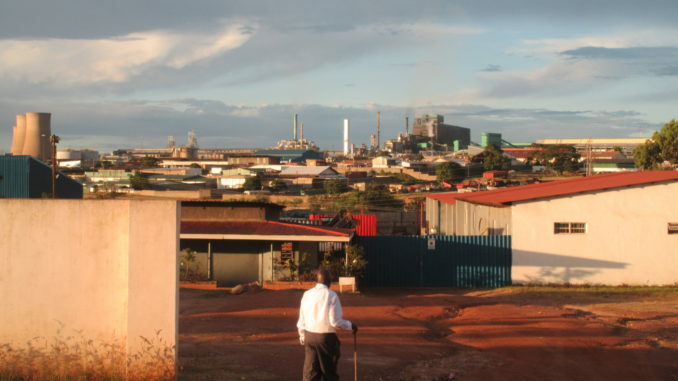 In the streets of the Zambian copper towns, I hear all sorts of half-truths and rumours about “the Chinese”, and not surprisingly, Chinese are mostly portrayed in a reductionist way. For instance, one of the rumours has it that the Chinese who come to work and live in Zambia are ex-prisoners who have been expelled from China with no option to return. According to the rumour, the Zambian government has agreed to accommodate these personae non gratae, who are now exploiting Zambia’s mineral wealth and work force as well as harassing Zambian women. Balanced accounts of the Zambian-Chinese encounter are rare. One of them is Mukuka Chipanta’s debut novel A Casualty of Power (2016), published by Weaver Press, the Zimbabwean publishing house that recently had a major success with Tendai Huchu’s delightful debut The Hairdresser of Harare (2010). Mukuka Chipanta is a “son of Kitwe” and is now based in the States working as an aerospace engineer. He chose the subject of his debut in what he refers to in an interview with Radio Incenglo as a “clash of cultures”. Yet his narrative about the Zambian-Chinese encounter in the mining industry is a balanced and careful one, a successful attempt to move away from a one-sided portrayal of “Zambian victims” and “Chinese exploiters.” As it turns out, the “clash of cultures” that Chipanta had on his mind is as much the one between common Zambian mineworkers and opportunistic union activists and government officials turning a blind eye on labour law violations as it is the one between Zambians and “the Chinese”. Chipanta grew up in Kitwe during the boom times of the mining industry, a time that is remembered for prosperity and expansion of state services in the sectors of health and education. But he also witnessed the decline of the mining sector due to sinking copper prices, and eventually the privatization of mines and the growing Chinese influence since the 1990s. The storyline of A Casualty of Power revolves around the main character Hamoonga Moya. Hamoonga, a resident of Kitwe from a humble background raised by a single mother in Kwacha, one of Kitwe’s most notorious townships, moves to Lusaka to study journalism. He is the first one in his family to attend college and he has high hopes. He enjoys his studies and makes friends. He is also involved in a discussion group with a handful of other students. This is perhaps the most engaging part of the novel. In vivid portrayals of the students’ debates, who have differing opinions on the Chinese presence in Zambia, Chipanta presents a nuanced, multi-perspective narrative. One of the recurring tropes in these discussions and in the novel as a whole is the role that the Zambian government plays in all of this. His (fictitious) government turns a blind eye to violations of the labour law and safety requirements and is involved in large-scale corruption. Hamoonga’s hopes for a prosperous future are shattered as he gets in the way of a high government official. He ends up as a political prisoner and serves several years in jail where he experiences brutal torture. After his prison sentence, a broken and destitute Hamoonga returns to his home town Kitwe. Without having finished his degree, he has no other opportunity but to take up a job in a Chinese-owned mine as an unskilled labourer. Soon he gets involved in organized protest. He rises to become the number one spokesperson of the labour movement, unafraid of both the Chinese mine owners and the Zambian government officials and unionists. But soon he finds himself again trapped in the dangerous web of politics and corruption. Hamoonga’s life is full of hardships, yet there are various humorous passages in the novel, and especially at the end one cannot miss the glimpse of hope Chipanta weaves into his narrative. Chipanta’s portrayal of the Chinese main character of the story, Jinan Hu, is another example of his careful attempt to look at the problem from various perspectives. The novel starts off with a violent scene in which Jinan Hu shoots and kills one Zambian mine-worker during a labour protest. But through the pages, the reader gets to see Jinan from a different perspective. His and his family’s struggle to eke out a living in one of China’s megacities and Jinan’s tragic loss of his wife and son in an accident has turned the decent husband and father into a sad and bitter man. Although A Casualty of Power is a work of fiction, the story has various not always subtle references to Zambia’s recent political history, the most curious being the failed coup attempt against the first president in 1980. Another is the analogy that several characters in the novel draw between the struggle for independence, a struggle whose base were the strong trade unions, and the new struggle against neoliberalism and its foreign investors, many of them Chinese. While in both struggles the grievances were similar, the ones responsible for the conditions in the mines have changed. It is no longer the colonial government, but the Zambian one that must be held responsible. Chipanta’s account could be interpreted as a critique of Zambia’s ruling class and its unions that have grown into opportunistic self-serving organizations. Despite all the historical references A Casualty of Power, is a piece of fiction with all the liberties that come with it, and that is what it makes is such a good read. Mukuka Chipanta’s debut is a thoughtful piece of fiction and interestingly written, if albeit the countless tragedies in Hamoonga Moya’s life leave the reader exhausted. It is a very welcome contribution not only to the debate about Chinese-Zambian relations, but also to the Zambian literary world, and African literature in general.